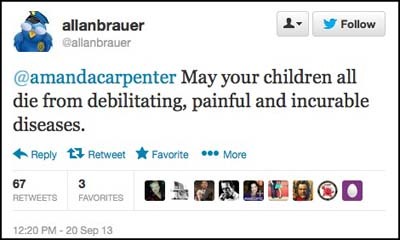 Sacramento County Democratic Party communications chair Allan Brauer was so upset by Amanda Carpenter’s advocacy of defunding ruinous Obamacare that he jumped to his Twitter account to show how much hate is in the heart of Democrats. At first this creep dug in and was defending his hate-filled, Democrat BS. But it wasn’t long before even other Democrats started to complain that he was making them look bad. Eventually this creep begrudgingly apologized for appearances sake because he began to fear for his position in the California Democrat Party. But based on his long, long history of foul language-filled Tweets and his constantly expressed hope that Republicans would be killed or harmed in some physical way, it is clear he did not mean his apology. At first it seemed he wouldn’t have to fear being fired, though. Tenoch Flores, spokesman for the California Democratic Party, did excoriate Brauer for his ignorant Tweets, but also noted that there would be no repercussions. His job as Com Director was safe. Of course, if this were a Republican that had told a woman–war on women, and all–that he hoped her children would die in the most painful of ways, the story would have instantly become a national issue and the man’s political career would have been laid in ruins. He would have been fired within hours and forced to slink off into obscurity for the rest of his life over such behavior. It just shows the stunning double standard once again. Democrats can be as filled with hate, as violent, as sexually perverse, as ignorant and criminal as they like and other Democrats will rally around them and give them a pass on their behavior. Fortunately, the Sacramento County Democrat Party did have a change of heart because Party officials realized how bad this creep made them look. After initially defending him and saying his job was safe, the Party suddenly accepted his resignation…. meaning he was pressured to quit. 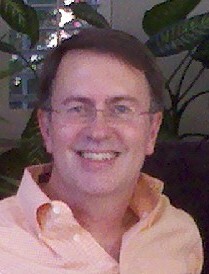 Allan Brauer is a creep of the highest order. And, unlike most Democrats, he got what he deserves.